When gardeners look at espaliered fruit trees many think that pruning and upkeep looks difficult. Once established it is actually fairly simple. So consider planting espaliers especially if you are looking to grow a fruit tree in a small space they may well be the solution for you. All the fashion in the Victorian era espaliered and fanned fruit trees are again gaining a place in the garden. Not only as a space saving way of growing a fruit tree, but also a as a way of improving yield in a small space as well as a design feature. But what actually is espalier all about. 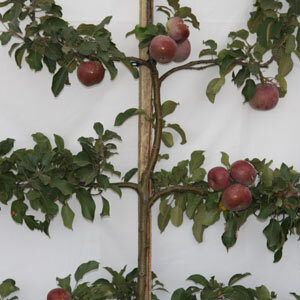 Simply the method of training fruit trees (and other plants) to grow against a flat wall of simply on horizontal plain. Some use it as a practical space saving method of growing fruit trees, other use it as an art form and integral part of garden design. In smaller courtyards, along fences or even trained in the open garden as a dividing screen espaliers are all the rage. The main leader is allowed to grow upwards while the side growth is trained horizontally at regular intervals along a wall or on supporting wires. Forcing a fruit tree to grow this way changes the way the sap flows and encourages prolific fruiting. A sunny position is essential as with most fruit trees, prepare the soil as you normally would and then consider the supports. If you are buying a tree that is already part trained, then support or wires will need to placed at the right height. If you are 'training your own' then you can usually grow to supports that are about 15" apart. The central leader is allowed to grow upwards and the side branches are carefully selected and then trained to grow along the wires. Growth that goes in other directions is removed. This is similar to normal fruit trees except we are pruning to a flat plane and tying back new growth to train it to grow out, rather than up. It is the geometrical pattern that we are really after to create a strong architectural look. The structure will consist of the trunk, side branches and then fruiting spurs. The decision as to how many side branches is up to you, but consider ease of pruning and therefore limiting the overall height. So the shoots between the trained horizontal branches are pruned back each year to shorter stubs around 15cm long that will fruit. Remember to tie the horizontal growth to the supports, not 'weave it through', this makes pruning much easier later on. And what about Cordons ? This is actually a single stem system and they are traditionally trained on a 45 degree angle. What Fruit Trees can be espaliered? It used to mainly pears and apples, however today we see olive trees, lemons, and stone fruit as well. And you can espalier Dwarf Fruit trees as well. Certainly Apples and Pears seem to take to this form of growing, but give it try with any fruit tree, we have even seen pomegranates treated this way. Do espaliers need to be against a wall? Nearly all fruit trees can be espaliered. Why espalier fruit trees? To save space, to create a screen, to allow the fruit tree to be grown against a wall, or just because it looks great. You can buy trees that have started to be trained or you can get out the secateurs trellis and garden ties and do the job yourself.